My sweet friend, Alex (thanks again! ), brought over a fabulous dinner last night so I cannot take credit for this. But I can tell you it was absolutely amazing and I will be making this soon! I have a hunch she spent a lot of time getting this meal together so knowing me, I’d probably make some short cuts here and there. Preheat oven to 45o degrees. Line a baking sheet with foil and spray with coconut oil, set aside. Cut the peppers in half and clean out the seeds and innards. Place them on a baking sheet skin side up. Bake peppers for 15 to 20 minutes. Once the skins are brownish-black, remove from the oven and immediately place the peppers in a large ziploc bag. Close and let sit for 20 minutes or so (or until the peppers have time to cool and “sweat”). Once they have cooled you will be able to peel the skins right off. **To roast asparagus, toss asaragus in a little olive oil and season with a little salt and pepper. Roast in the 450 degree oven for 5-10 minutes, depending on size of asparagus, while bell peppers roast. Remove and allow to cool before cutting into small pieces. In the bowl of a food processor combine parsley, basil, apple cider vinegar, mustard, garlic, and salt. While food processor is running slowly add olive oil in a small drizzle. You may have to stop the food processor to scrape the sides. You want the mixture to come to a liquid consistency. Add fresh ground pepper to taste. Add dressing to chicken salad and toss to combine. Serve chilled or at room temperature. Makes about 6 to 8 servings of salad. And to really save time on this meal, I would use some of our pre-made Sunday night grilled chicken, use fresh pre-cut sweet peppers and purple onions, and maybe skip the roasted of the peppers and asparagus and lightly steam it or just throw it in raw. That should save a good 20 minutes of work, at least. Now, I can make this dish!!! This is going on my “Keeper” list. Jordan - OH MY GOSH!!! 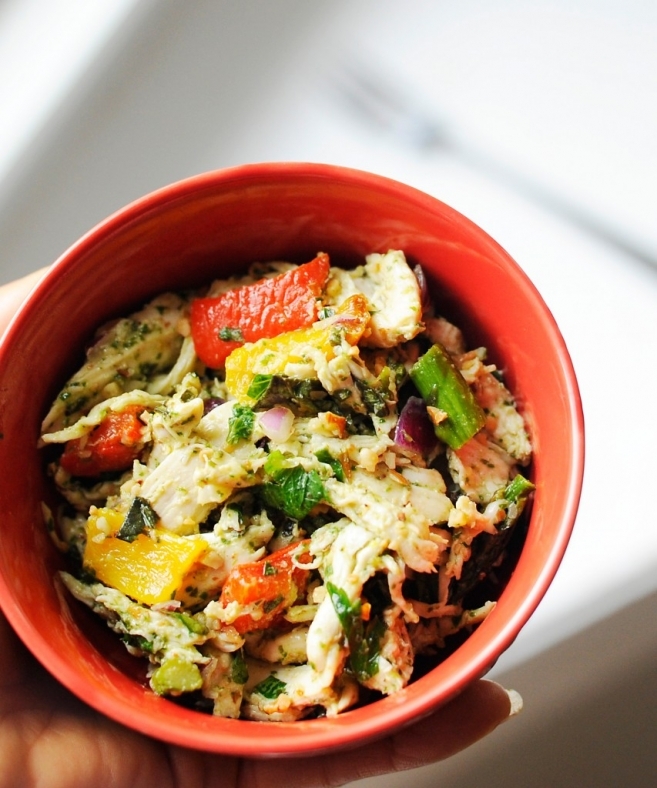 This is the most amazing chicken salad on the face of the planet!!! SO DELICIOUS! Thank you for posting L!